The process of career change can be difficult and stressful. If this has come about by redundancy then this may be particularly so and may take some time to come to terms with. ​​Redundancy can represent a significant upheaval in terms of the anticipated or prospective changes to come. It can be useful to consider the emotional side of the process you are undertaking and to think about what you might expect to experience. Give yourself time to go through this process. You may experience a temporary or occasional decrease in your self-confidence. Take steps to look after yourself. 1. Tell family and friends about the situation, especially those from whom you can expect support and encouragement. You will need their help and support during the period to come. 2. Do not be tempted to rush off CVs and applications in all directions. Ill-considered and poorly prepared applications are unlikely to be successful and a mailbox full of rejections at this stage is not encouraging. Further they are unlikely to lead to the right job for you. 3. Maintain good relations with your previous employers and colleagues. They can become useful contacts for job searching. 4. If you have been made redundant, understand the details of the redundancy package and the financial assistance available to you (for example, contact your mortgage company and advise them of the situation, perhaps discuss a short-term overdraft or increase in existing overdraft with your bank). Get qualified advice about your financial options. 5. Undertake a self-assessment process: think through your skills, experience, attributes etc. Think through your requirements for the next job (role, salary, location, etc.). Part 2 will provide guidance in doing this. 6. Be aware of the need to prepare your job search carefully and all interviews that result. 7. Allow yourself periods of despondency and expect a degree of rejection from employers. This can be hard to accept, especially if you have received many rejections. Remember you have to go through a number of NOs before you get to YES. In between brief periods of rest remember to maintain an appropriate mindset – positive, enthusiastic, organised and focused. 8. Use the situation to positive effect. Embarking on a career change may become one of the best things that ever happens to you. ​People differ hugely in their response to redundancy. Some find the experience to be devastating, and others, a great liberation. Most however fall somewhere in between. It is not our intention to proscribe your feelings and experiences at this time. It might however be helpful to be aware of the range of feelings you may experience and to set your expectations accordingly. In this way if you have a particularly ‘bad’ day you can set that in context and recognise that tomorrow will be different. This can also be helpful information for your family members and friends. ​You may experience some or all of these stages, in the same or in a jumbled sequence. Be prepared to experience different moods, and again ensure that those around you are similarly prepared. If you are feeling particularly depressed or anxious do speak to your coach for assistance and support. What are you currently feeling about your employment situation? 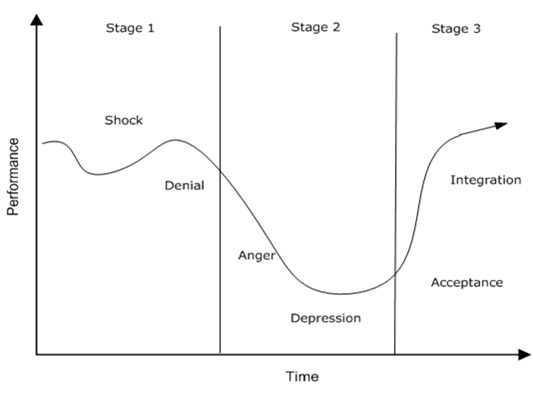 Can you identify where you are on the Transition Curve? What are your current thoughts and feelings on your employment situation? ​Redundancy is not all doom and gloom. You may feel exhilarated and upbeat about the situation and this will give you a positive start to moving on. We know that job hunting success is clearly associated with a positive approach: being enthusiastic, confident and optimistic will significantly enhance your prospects. Equally clearly, if you are dissatisfied with your current role or have just ‘lost’ your job this is very often the opposite of what you may feel. However developing and maintaining resilience will not only assist you through this current period but will also materially benefit you in your future career, and life. This is just one way in which one can turn a difficult situation to advantage. Be aware of your current feelings and thoughts and give some time to getting into the “right” mindset. For many of us our work, and our job title, provides much of the meaning in our lives and our definition or sense of our selves. When we lose a job it is easy to feel that this sense and purpose is also lost. It is important to recognise that you are still the same person with the same abilities, values, purpose and so on – your job does not define you. 7. work to your weekly plan (we will work on this); at the end of each week review the week and reflect on your achievements, no matter how small you feel them to be. Everything you are doing now is a step to your next role. • ACEs were far more optimistic and proactive, typically using five or more sources for job searching. Chasers used three or less. • ACEs were very focused on what they were looking for; Chasers tended to browse. • The average length of job search for ACEs was 4 months; the average for Chasers was 7 months. • ACEs were applying for 8 jobs a month and getting 2 interviews a month. 65% of them had applied directly to the employer. • Two-thirds of job offers were rejected (in rank order, due to terms and conditions, role and responsibilities, waiting for other offers, job did not match the description, did not wish to relocate). • For both ACEs and Chasers, networking was reported as the number one source of securing their last job. Sources actually used for this job search in order of popularity were job sites, press ads, search engines, recruitment companies. Networking was 7th! As you go through your job searching activity in Part 4 it is worth keeping these three points in mind. Regularly ask yourself what practical steps you are taking to maintain a positive attitude, take control and network. What will you do to maintain a positive attitude? What will you do take control of your activities and time? What will you do to network? Finances – it is important at this early stage to assess your financial situation and calculate how long any money you receive will last you and at what rate of expenditure. Take into account any other financial investments or plans (eg., insurance, health cover, pensions, etc) you may have and consider whether you need to make any provision for these. It may be helpful to contact an independent financial adviser to discuss these matters further (see http://www.unbiased.co.uk). - Be out of work, or working on average less than sixteen hours per week. - Be willing and able to start a job immediately. If you are looking for work in your usual occupation, you may be allowed a period of between one and thirteen weeks at the beginning of your claim, during which you are able to restrict your availability to that occupation and your normal rate of pay. You cannot normally refuse a job based on pay after six months. In this section we look at the steps required to get ready for job searching – understanding your requirements, your offering and your job market. You may already be clear what your next steps are. Alternatively the situation may present an opportunity to change your career (or indeed life) direction. In order that such an opportunity is not wasted it can be helpful at this time to look back over your career to date and reflect on the extent to which it has met your aspirations, expectations and hopes. Has it been fulfilling and satisfying thus far, or a means to an end? Looking forward into the future, think about how you might like that to unfold, particularly in terms of personal needs and fulfilment. Your coach will assist you in this process if required. If your thinking leads you into another direction, action planning can help you to take appropriate steps whether they are in re-training, taking a sideways job move, relocation, etc. As before, in taking control of your activities and direction you are nearer to achieving your goals. There are many and varied ways to achieving your next career goal whether that is another similar job, a career change, or a complete lifestyle change. You are likely to achieve this more quickly and more effectively by taking a structured approach to your activities. In this section, we outline a structured planning approach which your coach will be happy to assist you with. We know that adopting a planned approach to job seeking and related activities significantly enhances your success, ensuring that your efforts are well thought out and coordinated, and importantly, leaving you firmly in control of your actions. Maintaining control in this way is extremely important to maintaining self-confidence and a positive attitude. This then leads you into a plan to conduct your marketing campaign. Thinking of this activity in this way often enables you to “objectify” this activity and can help you to regard it as a work assignment. The following steps provide a guide which is intended to assist you in defining your own plan. Your coach will work with you on this as required. These form your initial plan. You can upload a template document below. The final action defines the frequency and content of strategy reviews, and is an important one. Throughout your period of job searching you need to ensure that the approach you are using (for example the job market you are targeting, the sources you are using, your interview technique, and so on) is regularly reviewed to ensure that they are working for you. If you have not achieved the level of success required you should then take action to change your tactics and update your plan accordingly. Completing this plan gets you started. This plan shows example activities; you should add to or modify these to suit your own purposes. Once defined you should then use your plan, which you should update each week, to guide your activities through each week of job searching. Where will you look to find the jobs you will identify as being in your market? You will probably be able to add to both columns. Passive sources are those to which you merely respond in a generalised, non-targeted way. These sources tend to have a low success rate – in other words relying only on these methods will take you longer to secure a job and it is more likely that that job will be less suitable to you. Active sources are those you create or initiate yourself. They take more effort but have the advantage that the opportunities you create are less likely to be seen by other job seekers. These methods have a higher success rate than passive methods – in other words, by using these methods it will take you less time to secure a job than when using passive sources, and the job you secure is likely to be more suitable to you. We recommend that you use both passive and active methods and that you select at least 3 sources from both types. We strongly recommend that your active sources include networking and using your contacts. What passive sources do you intend to use in your job search? What active sources do you intend to use in your job search?